The dumbbell design is a very simple design for a free space habitat. It consist of two equal masses which are connected with a tether. This system then rotates around a common axis, and as a result a centrifugal force is generated which replace gravity. The tether is in most dumbbell designs about a few hundred meters, in order to prevent motion sickness as result of a high angular velocity. A longer tether means a lower angular velocity to generate an equal centrifugal force. This design is attractive for the first permanent human outposts in free space, since it requires relatively few resources to be constructed – as compared with O’Neill cylinders or Bernal spheres. The modules can be quite small, as long as both have more or less the same mass. 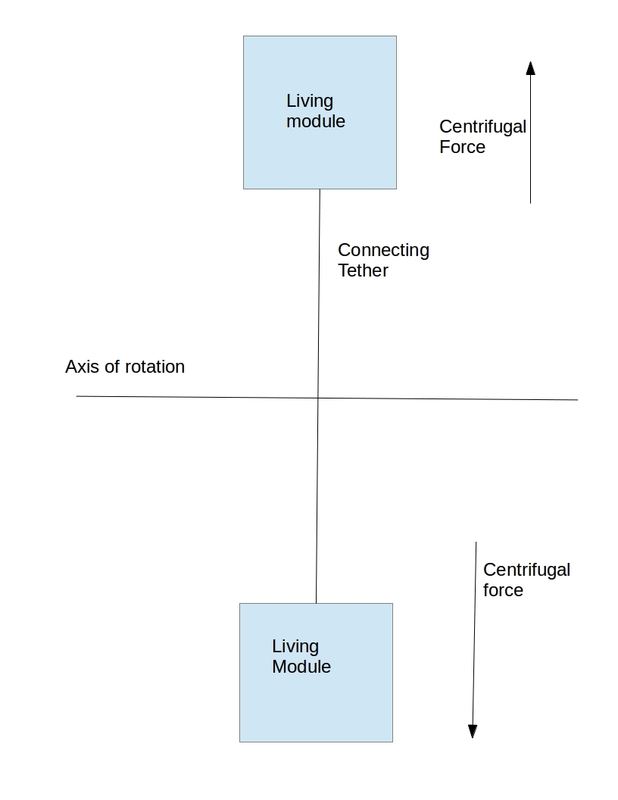 In the diagram above, I have drawn to “living modules”, though one of the modules could be assigned different functions. The habitat is powered by Solar energy. I did not draw the solar panels in the diagram, because their placement depends on the precise orientation of the structure to the Sun. Dumbbell habitats are not typically designed for large population, rather for a few dozen people. Nevertheless they are quite useful as they will serve as the base for the first space settlers, while they are working on the next generation of space habitats. Though dumbbells can be located anywhere in outer space, it would make most sense to locate them in the neighbourhood of resources, such as near earth asteroids. Through use of remote control the inhabitants of the dumbbell can operate mining equipment on NEAs. I imagine it’s quiet tricky to rendezvous supply and passenger vessels with such a design, unless there is a central hub which serves as the docking station, assuming the rate of rotation is small enough so a vehicle can match it. Also, it would be more beneficial if the tether were a tube that would allow inhabitants to climb down to the hub, and then, in weightlessness turn around and climb up to the other module. Otherwise the two modules would have almost no way to exchange resources. The rendezvous would indeed be a complex maneuver to execute, computers are probably needed to do it well. The tube as a tether is an interesting idea. Alternatively the residents would need to use climbing gear to travel alongside the tether. I can’t imagine a rendezvous with either pod even possible. It would require computer control and immense amount of fuel. Then, once docked, the imbalance of masses between the two sides would throw the entire system off. Therefore it has to rendezvous at the hub, with a rotational element. This was well demonstrated in the movie Interstellar where the pod had to match speed and rotation with the out-of-control mothership after an accident. A very well-done scene, but the way. I agree that a rendezvous should happen at the hub. In particular, the issue of the mass imbalance as a result of the docking is a serious concern.